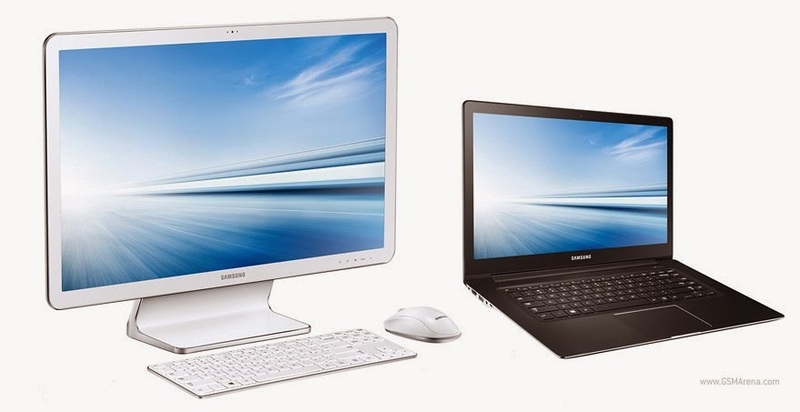 The Ativ One 7 2014 Edition is a sleek All-in-One PC with a 24-inch FullHD screen. The Book 9 2014 Edition is a spectacular ultrabook, which has a 15.6-inch FullHD screen and which yet weighs only 1.85 kg. The Ativ One 7 2014 Edition can act as a secure personal cloud server, allowing owners of Samsung Galaxy smartphones and tablets to store on the computer hard drive photos, movies, music and documents via Samsung Link mobile app. These users also have the option of wirelessly streaming music to the Ativ One 7′s Dolby Home Theater certified stereo 7W speakers via Bluetooth even when the computer is off. The Ativ Book 9 2014 Edition is Samsung’s newest addition to the Ativ notebook lineup. It’s powered by an Intel i5 or i7 ULV Haswell processors with Intel HD Graphics 4400, 8GB of RAM, up to 1024GB SSD, 2xUSB 3.0 ports, 1xUSB 2.0 port, a HDMI port, and a SD card slot. An Ethernet port is only available via a USB adapter. Supposedly, the screen is brighter and with better viewing angles than the previous generation Ativ Book. The notebook should provide up to 14h of usage on a single charge. The launch schedule and prices have not yet been disclosed, but the Ativ Book 9 2014 Edition should be available worldwide. The Ativ One 7 2014 Edition supposedly brings a superior screen and speakers compared to the previous model. We cannot attest to that just yet but it certainly stands out visually, when compared to the last year’s crop. There is also more storage on board with room for up to 2x1GB hard drives and a 128GB SSD. Optional touch control is still present, of course. Connectivity-wise, there are 2xUSB 3.0 ports, 2xUSB 2.0 ports, a HDMI in/out port and a built-in 3-in-1 card reader. The Ativ One 7 2014 Edition will launch in white in S. Korea starting in February 2014 (non-touch model) and April 2014 (touch model). Pricing, of course, will vary depending on the hardware configuration.